I’m a sucker for Nantucket which is the main setting of Elin Hilderbrand’s novels, but in The Identicals, the author added Martha’s Vineyard into the mix. This turned out to be a happy thing for me, because I got my fix with twice as many beaches, twice as many lighthouses, twice as many lobster rolls and twice as many ice creams. Happy days. There are also twice as many heroines as usual since The Identicals features twins Harper and Tabitha, forty year olds who have been estranged for 14 years. Harper is the easy-going screw-up who lives on Martha’s Vineyard, a community where everyone knows everybody else’s business. Harper recently ruined her reputation by having an affair with the married doctor who had been treating her dying father. Tabitha lives on Nantucket and is the elegant, stuffy twin. She is the mother of an out of control teenager, Ainsley, who has been brought up in the same disinterested way that her mother brought Tabitha up. (Harper and Tabitha’s parents divorced when they were teenagers, and in the style of The Parent Trap, each parent took a twin. Separating siblings didn’t work well for the twins in The Parent Trap or The Identicals). When their father dies, Tabitha and Harper swap places, with Harper going to Nantucket to look after Ainsley and to work in her mother’s exclusive fashion boutique which is on the brink of bankruptcy, while Tabitha moves to Martha’s Vineyard to renovate their father’s house to sell. These characters are flawed but I liked them regardless, I enjoyed the story and as always, loved the location. The Identicals is an easy summer read and I can imagine myself lying on a beach towel, feeling the warmth of the hot sun on my back as I read, in between dozing, paddling, collecting shells, swimming and riding the waves on the boogie board… pure bliss! I’m always surprised by how badly Elin Hilderbrand’s characters mess up their lives, and yet, I still like them. They drink to excess, use drugs and mess around with other people’s husbands, all things that I would avoid and judge in real life, but I love these books, which are pure escapism. The sections on the rivalry between the Nantucket and Martha’s Vineyard was clever, with the islands comparing themselves using a combination of sweetly pointed remarks, leaving the reading feeling as if the island are siblings much like Harper and Tabitha, who have their differences but love each other anyway. As always, I loved my annual fix of Elin Hilderbrand’s Nantucket, and am delighted to have gotten to know Martha’s Vineyard in The Identicals. Winter Storms is the third in the ‘Winter Street’ series by Elin Hilderbrand. I missed reading the middle story, Winter Stroll, but the characters and the story are familiar enough that I quickly caught up with what’s going on. (Much like missing a few episodes of a television soap opera). The ‘Winter Street’ stories follow the Quinn family through life on Nantucket. When I left the characters at the end of the first book, patriarch Kelly Quinn was doing okay, despite his second wife, Mitzi, leaving him for someone she had been having a Christmas affair with for the past 12 years. Kelly’s ex-wife Margaret, a famous newsreader, was back in the picture with Kelly romantically, and their children were having a few financial or romantic adventures of their own. Well, plenty of things must have happened in the second book, but just like watching a soapie, if you miss an episode or two you catch up again eventually. Kelly has been seriously ill, Mitzi came back, Margaret is marrying someone else, one of Kelly and Margaret’s sons is in jail for fraud, and Kelly and Mitzi’s son, a soldier, is missing in Afghanistan. For a bit of light relief, Kelly and Margaret’s daughter has two boyfriends whom she can’t decide between. Similarly to the first story in the series, Winter Storms finishes up at Christmas time, which is a big deal in the Quinn family and on Nantucket apparently. There are happy endings for most characters and worries for others. I can imagine this story going on and on and on, in the style of Alexander McCall Smith’s ‘Scotland Street’ series. Definitely a comfort read, and especially good for those of us who have their little dreams about life on Nantucket. The only thing that I didn’t like about The Rumor by Elin Hilderbrand was the American spelling of ‘rumor’ on the novel’s cover. In Australia this would generally be spelled ‘rumour,’ but I expect our market is too small for the publisher to make any money from printing an edition just for us. However, American spelling in the body of a book doesn’t annoy me at all so I got over this minor irritation quite quickly. Anyway, back to The Rumor. This story is about two women, Madeline and Grace, who have been best friends forever. They know everything about each other, their children are sweethearts, and their husbands are forced to entertain each other. Grace’s husband, Eddie, is a real estate agent and Grace and Eddie live a luxurious, glamorous life, while Madeline and her husband, Trevor, struggle financially but have a relationship which Grace envies. Below the surface though, things are not what they seem. Grace is an indulged, stay at home wife who is having an affair with her gardener, while Madeline, who is a novelist, is struggling to think of a plot for her next book after already spending her advance. Madeline is inspired by Grace’s affair (uh oh) and starts writing a book that looks like being a bestseller, but she fails to change the identifying details of Grace’s affair (double uh oh). Meanwhile, Eddie is desperately short of money and although his painful heartburn acts as his conscience, he forms a prostitution ring made up of his real estate business’ cleaners to rake in some cash. Regular readers of Elin Hilderbrand will recognise characters who have featured in other novels, which give the reader a sense of belonging to her version of Nantucket too. Everybody in the community know, or guess at everybody else’s business constantly, so not surprisingly wild rumours go around the island about all of these characters in The Rumor. Things work out as they are meant to, however, and if the resolutions were a little predictable, then that didn’t bother me at all. The Rumor is a perfect beach read. After reading just about everything Elin Hilderbrand has published, I’ve become a little bit obsessed by Nantucket, an island off Massachusetts, the setting of Winter Street and other novels by this author. I’ve Googled the beaches and the lighthouse, checked the weather report and the price of real estate. I’ve even read about Nantucket’s history, and I’ve obviously laughed at Nantucket limericks, (mostly unrepeatable, but very funny). Winter Street was an enjoyable story which I ended up finishing late last night. Usually I’m fairly rigid about bedtime, as I get up early and work quite long hours, but this author has the ability to make me keep turning the pages, even though I know I will suffer the next day. 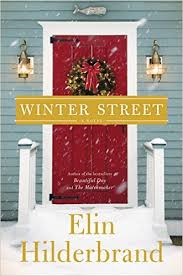 Winter Street starts with Kelley Quinn walking in on his second wife, Mitzi, kissing George, a family friend who stays with them in their Nantucket Winter Street Inn every year over the Christmas holiday. It emerges that Mitzi and George have been having a Christmas affair for 12 years, and that Mitzi has already packed her bags, because this year, she and George are making their fling permanent. Kelley’s adult children from his first marriage also feature in this story. Ava is in love with someone who doesn’t love her, Kevin is seen by his family as a loser and Patrick, the oldest of the Quinn children, is an over-achiever who has a guilty conscience. Kelley and Mitzi also have a son, Bart, who used to be a spoiled brat but is now a soldier in Afghanistan. Kelley’s first wife, Margaret, the mother of Patrick, Ava and Kevin, has her own story too, and she is much more likeable than Mitzi, (although the reader was never going to be on Mitzi’s side after seeing her kissing George through Kelley’s eyes). But, back to Margaret. Margaret and Kelley’s marriage ended amicably when their children were quite small, when Margaret’s career as a journalist took off. Elin Hilderbrand has the same quality as all of my favourite authors, which is the ability to make me feel as if I know and like, and in some cases, feel very fond of her characters. Her stories can be a little predictable, but that is allowed, because for me, her books are a comfort read. Perfect reading for a cold winter night in Melbourne.